The Nikola Motor company – a US startup that has collected over US$3 billion (A$4 billion) in deposits for its emissions-free heavy-duty electric truck scheduled to be unveiled in December – has flipped on its North American backers. While those who have placed a deposit – worth up to $500,000 – on a semi outside the US and Canada will still receive a compressed natural gas (CNG) turbine version as previously promised, those in North America will not. In a press statement, the company says it will instead supply those markets with "a custom-built hydrogen-electric 800V fuel cell" version that would require customers to visit a hydrogen station to refuel. An issue the company says it will fix by launching 50 stations by 2020 – approximately one per state in the US and seven in Canada. Even with a reported range of 1,200 miles (1,930km), that might make freight routing a concern for some customers. Nikola will have no issues with the US government however, with its hydrogen trucks able to achieve 20mpg (8.5km per litre) at full load. The numbers mean it bests the mandates placed by the government over the next decade and recent changes by the EPA in the region. Supplying the energy will be a series of solar farms, Nikola Motor Company CEO Trevor Milton says. "The desire to be 100 per cent emission free in the US and Canada is a critical piece of our long-term engineering and environmental efforts, not just in vehicle energy consumption, but also in how energy is produced," he says. 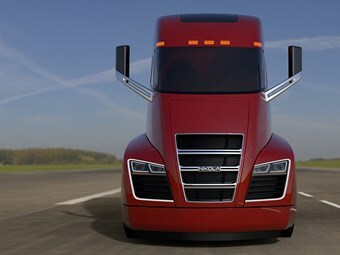 "Nikola will produce hydrogen via zero emission solar farms built by Nikola Motor Company. "These solar farms will produce over 100 megawatts each and will use electrolysis to create hydrogen from water." Milton says the "manufacturing facilities will be run off of zero emission hydrogen energy" also, making "Nikola Motor Company the first company in the world to be 100% emission-free from energy production to transportation to consumption." The company will host a launch event on December 1 in Salt Lake City, Utah.